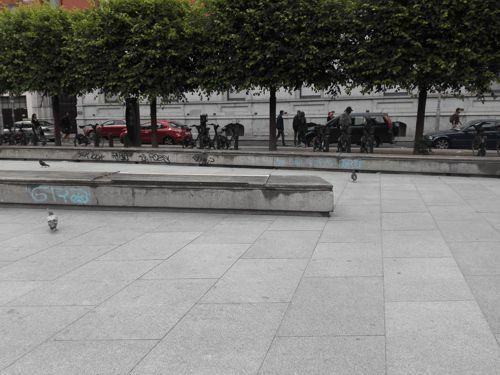 After years of Dublin City Council (DCC) vandalism and neglect, its senior management has conceded that the current layout of Wolfe Tone Park which it manages – and indeed designs – has not worked, and redevelopment is being considered. But are DCC capable of appropriately redeveloping the park; and, can they be trusted to? Wolfe Tone Park is located on the site of the old St Mary’s Churchyard: the cemetery attached to the church on Mary Street, opposite the Jervis St Shoping Centre. For almost three centuries the park served the community and its visitors as a place to respect the dead and, later, a place to embrace the living. Local residents share fond memories of the park as their childhood playground and communal garden, while photographs reveal the park as a popular sanctuary for respite in a busy city-centre. However, with the arrival of the Jervis Centre and a desire to extend the success of Henry St as far as Capel St, the City Council considered there was an imperative to cater for commerce, and the tired shopper – more than beleaguered inner city residents whose voice rarely registers with usually suburban decision-makers. In this case residents too were content with changes in the belief that the walls and railings conduced to “anti-social behaviour” and made it difficult to police the park. In the event, there has been no diminution of obnoxious gatherings in the park. The space and indeed the area are so hostile to children and families that it is inevitable there will be drinking and the public carousing that characterises much activity in many of Ireland’s urban parks. The slate was clean for DCC to redevelop the park into a faux European-style plaza. 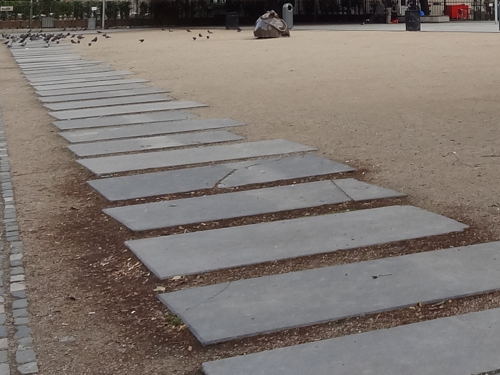 In 2001 the park garden and railings were removed, and the headstones, which had been uprooted years before, re-arranged to accommodate a bland, windswept plaza furnished with a bleak array of concrete plinths that serve as seating. 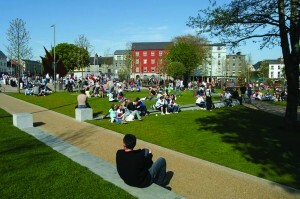 The new and voguish plaza was described as an “urban beach” by Boyd Cody Architects which won the architectural competition to overhaul the park for DCC, but the grass that was its centrepiece has long-since been removed by the DCC, without any attempt to obtain planning permission or to assess the environmental impact. St Mary’s Church, the oldest parish church in Dublin and one of its most important buildings has been converted to pub use, with drinkers swilling over memorial headstones in a Wren-quality building that deserves more dignity. Since 2001, the park has been commercialised and sterilised by DCC. Like waves eroding a cliff-face, under-attended gaudy events and commercial promotions consume what remains of the park. 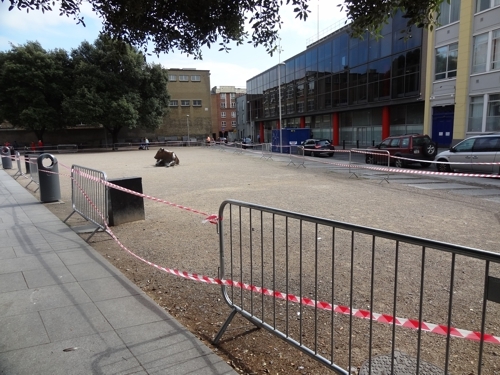 One TV3 production, ‘The Box’, did enough damage to warrant the closure of the park to the public for three months as the last solitary wedge of grass was removed to make way for the brown desert-like deposit that can be seen there today. However, applying the cautionary theory of the broken window – where tolerance of a single act of vandalism encourages others to vandalise – DCC cast the first stone. DCC continues to renege on a 2006 commitment to restore the park while facilitating and effecting damage to, and disparagement of, the relics of the original setting. Many of the headstones around the park have been defaced, and some broken by DCC’s own vehicles; other vehicles are permitted to join in the destruction while conducting typically tasteless events. Reports of infringement to DCC are met with apathy; we do not know of a single resident complaint or concern that has been heeded by the council in relation to Wolfe Tone Park. For years the park has been used to house what is believed to be, a DCC staff toilet within a vandalised metal container. DCC staff occupy the parking bays on the west side of the park; identifiable by the branded vests draped over the steering wheels. A ‘Dublin City Centre BID [Business Improvement District] Company Ltd’ (BID) information kiosk was wheeled into the park, presumably from Henry Street, and has been abandoned for the past few months. The DCC litter helpline failed to have the obstruction removed; suggesting either a lack of willingness or control. Suppliers of goods and services to the Church Bar regularly park their vehicles on the north end, while ordinary residents and visitors anxiously await the next time we are a few minutes late returning to our clamped cars on Jervis Street – that is, if indeed, we can find a vacant space to begin with. 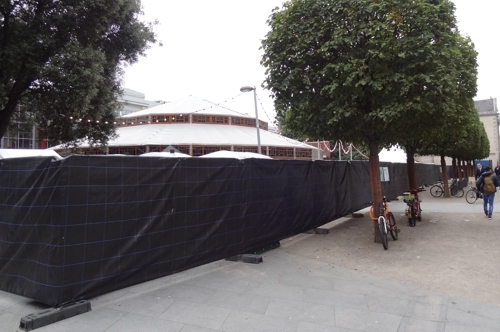 Today the park is closed to the public, hidden behind black hoardings and beneath the stage of Dublin Fringe Festival Ltd’s Spiegeltent; another antisocial event that will broadcast amplified music into the homes of residents living only fifteen meters away for the next three weeks. 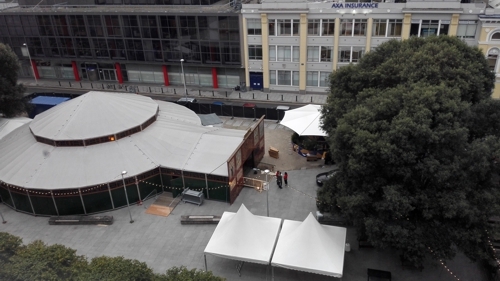 It is clear that the park, which should be an amenity for hard-pressed residents in one of the least green parts of the city, is an inappropriate venue for events such as funfairs and ice rinks, but despite appeals and objections from local residents DCC have granted permission for the Tiger Beer Dublin Fringe Festival circus. Of concern too is that, after months of objections and requests for information, residents were directly informed that permission for the event had been granted only hours before the circus rolled into the park. This would suggest that the event was advertised long before permission was granted, or that DCC waited until the eleventh hour to notify the residents that permission had been granted for the amplified music event that will run until at least 11pm/12am for three weeks in September. Perhaps deluded by group-think, encouraged by internal back-slapping, or empowered by commercial belly-scratching DCC staff appear oblivious of their own contribution to the demise of the park. 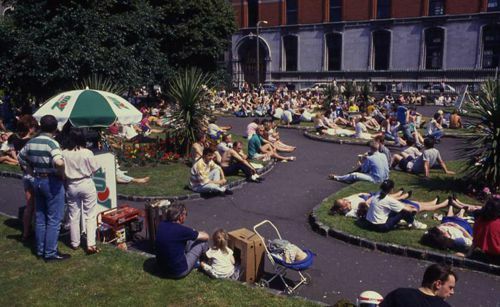 At a DCC/BID meeting in March, BID members proposed that the park be rebranded as “Wolfe Tone Square” in a cynical attempt to lower public expectations of ‘the space’. Discussions also took place about the commercial value of ‘the square’ and the idea of extending the park into a neighbouring business that would accept a rent from the council. This fee would, of course, be offset by other commercial ventures proposed for the park. But why would DCC consider another circus tent, Spiegeltent, carnival, Ferris wheel, ad-space, or coffee kiosk over a simple garden park contained within traditional railings in an area deprived of green space? While some may suspect that DCCs’ failure to provide a public green space is a carefully engineered softening-up exercise to push through BIDs commercial proposal, it might very well be the case that DCC are just not up to the task of developing or maintaining Wolfe Tone Park. 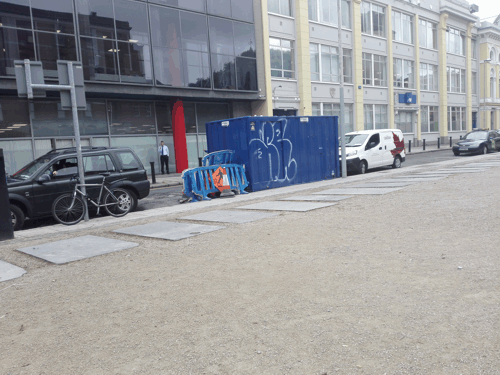 In any case, Dublin City BID Company Ltd (BID) should not be leading a proposed redevelopment of a public space; and DCC should surrender the public asset, that they have destroyed, to the Office of Public Works (OPW). The handover should be simple: the OPW can easily be found in Dublin, maintaining St Stephen’s Green and The Phoenix Park. 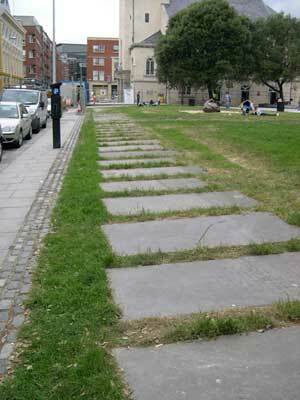 Everyone agrees that Wolfe Tone Park needs a bit of TLC. 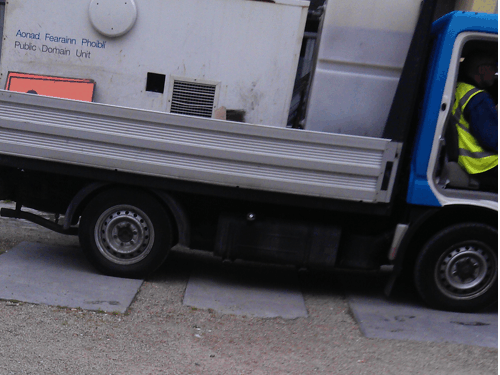 Home to the council’s portable staff toilets, its hard, dull appearance does little to entice people in. And neither do the loiterers drinking cans at midday or people diving behind the historic tombstones on search-and-rescue missions for stashed drugs. The local residents have been campaigning since 2006 to get some greenery returned to the park. Now, because of worries about its future, they’ve revived their effort and formed the Jervis/Wolfe Tone Park Community group. 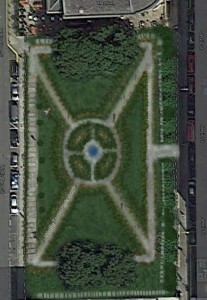 Their goal: to see the park restored to its previous grass-filled, fully-fenced design of the 1990s. Mannix Flynn, who was there, says he was shocked. “It’s not good enough,” he says. “It’s all too often you see this indifference.” After they eventually met with council officials, the community group opposed the event. But they were informed the day before it was set up, that the council had granted it permission to go ahead. A Dublin City Council spokesperson says the council spoke with residents about the event, and that further consultation would have been arranged if it had been requested. Ciarán Flynn says he’d like to see the Office of Public Works take over the site, because Dublin City Council has failed. Flynn says he is genuinely worried about the future of the space – which, as it is, can be closed off to locals without a ticket. He’d like to see it given back to the people of Dublin, he says. “We’d also like to put forward the idea that locals would actually work in maintaining and stewarding the area . . . I can’t see why that wouldn’t help curtailing some of the anti-social behaviour,” says Flynn. Councillor Mannix Flynn says some organisations would like to see the park turned into a commercial concern. But he doesn’t want to see that happen. People should be afforded a bit of down time, when they aren’t being targeted commercially, says the councillor. He thinks the space should be a place for “workers, children and shoppers to get away from the hustle and bustle”. “You can’t give in to anti-social behaviour by making the place hostile to everyone,” he says. THE former park at Wolfe Tone Square should be restored as a green space featuring its ancient grave stones, a city councillor has argued. 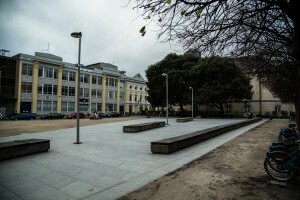 The park, which had become known for anti-social behaviour was converted into a modern plaza in 1998 to mark the 200th anniversary of the death of Irish revolutionary Theobald Wolfe Tone, who was born nearby. Now Cllr Mannix Flynn wants to see the green area restored, criticising the lack of parks on the city's northside and describing the current set-up at the square as "hostile". "It was a place that a of people would come to visit with the beautiful church and park," he told the Herald. "A while back there was a bit of anti-social behaviour in the park and because of that it was more or less demolished by the City Council and all traces of its origin have been wiped off." Cllr Flynn said that there is "nothing inviting" about the area since the park was built over. "The grounds of the old park are now just hostile," he said. Many of the headstones from the original graveyard beside St Mary's Church have been moved in what Cllr Flynn branded an act of "sacrilege". sacrilege "In my opinion they've basically committed an act of sacrilege by turning the old headstones into flagstones," he said. "This part of the city is ideal for regeneration and there's a real lack of green space in the O'Connell Street area - there isn't even a place to sit down." The councillor suggested that more of an effort should be made to turn the park into a commemoration for the national historical figure, and that the current plaza should be redesigned into a green space similar to the original park. "This place would enshrine the legacy of Wolfe Tone in this decade of celebrations and commemorations," he said in a motion to Dublin City Council. "A living, thriving space in the form of a green park with a connection to the origins of the original park green space and graveyard would be ideal," he said. Hundreds of businesses have signed a petition protesting the “double taxation” imposed by mandatory payments to the Dublin Business Improvement District (Bid) and seeking a means to leave the organisation. 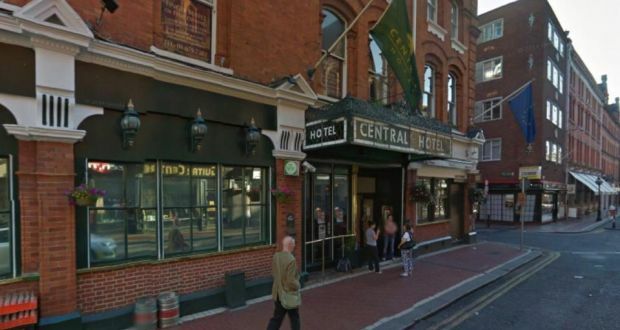 The signatories, including well known names such as Stock, the Central Hotel, Rhinestone Jewellers and Lillie’s Bordello have expressed frustration at having to pay a levy for the Bid which “overlaps” with local authority rates. Organisers say support has now grown to more than 500 businesses. The Bid, which is branded “We Are Dublin Town”, was established in 2007 and renewed with majority backing in 2012, giving it a mandate to improve footfall in the city centre through marketing and promotional initiatives, a function it says it performs to a high standard. The organisation covers 2,648 premises in the capital’s central business district incorporating large parts of Dublin 1 and Dublin 2 postcodes. Grounded in legislation, and modelled on other jurisdictions, particularly the UK, companies pay a levy to the company through Dublin City Council as a percentage of, and in addition to, their rates. Controversy surrounding the system is not new. Last year, many businesses in Dún Laoghaire were vexed at having to participate, with just a 55 per cent vote in support. In Dublin, the petition has attracted backing from a number of hotels, travel agents and numerous retail outlets. One of its proponents, Kate O’Neil of the Silver Trout on South King Street, said payment should be voluntary. “I have seen no improvement or uplift in trading conditions nor any cost benefit to my business since the inception of Bid in 2007,” she said. Bid chief executive Richard Guiney roundly defended its work and said it had twice received the democratic backing of its members, without which it could not function. “Businesses who pay us, if they felt that we were just duplicating what Dublin City Council did, well they would just say no,” he said. That position is borne out in the voting. In 2012, 1,063 backed the continuation of the Bid with 511 against (68 per cent of a 45 per cent turnout). Ratepayers vote every five years and Mr Guiney is confident of an increase in support in 2017. He cites several initiatives, including promotional campaigns like the Dublin Fashion Show and Dublin at Christmas; a close working relationship with gardaí to tackle anti-social behaviour, graffiti and street cleaning; reduced waste and insurance costs and the provision of Christmas lights (20 per cent of its approximate €3 million annual spend). It’s Sunday morning in the Phoenix Park. A group of Brazilians are playing football under the shadow of the Wellington Monument. In the distance a herd of deer look on. One suspects the Duke of Ormond would be happy to know that 350 years after he purchased the lands for a royal deer-park, deer and residents happily share the space. Yet all is not well with the state of our parks. As cities increase in population development pressures threaten the future of green space. A new generation of city residents living in small apartments expect more from their parks, and cash-strapped local authorities find it difficult to meet changing expectations on shrinking budgets. The Phoenix Park itself is riven by roadways and has been described as “remorseless prairie, pitches and link-roads” with little of the sequestered charm of New York’s Central Park or London’s great parks. The Croppies Acre Park in front of Collins Barracks is currently closed to the public and was recently transferred from the Office of Public Works to Dublin City Council. The ambitious plans for a park at the Royal Canal beside the National Conference Centre in Dublin’s Docklands have not been realised. The Liffey Quays which could be a linear park from Heuston Station to Dublin Bay are choked with cars, with footpaths barely wide enough in parts for a single pedestrian. Uproar in certain quarters greeted proposals for traffic calming there. The park at Ormond Square in the north inner city has a sign banning football a few metres away from the plaque marking the birthplace of footballer Johnny Giles. Green spaces are often converted to ‘hard’ spaces as local authorities find them easier to maintain. Eyre Square and Wolfe Tone park are unfortunate manifestations of the tendancy. However, there have been notable achievements in recent years. Ringsend Nature Park is a wonderful linear park between the city and the sea on the site of a former landfill site. St Catherine’s Park in Lucan combines old woodlands and playing pitches beside the banks of the River Liffey, and it must also be one of the few Irish parks with its own Twitter account. 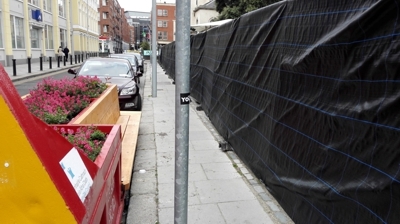 In Dublin’s North Inner City the City Council finally landscaped a derelict site on North King Street that had been in their ownership for a quarter of a century. It now has been grassed and planted with shrubs and trees and is a model for ‘temporary use’ parks that make use of lands that face an uncertain future. A similar approach was taken with Granby Park, a ‘pop-up’ park on Dominick Street last summer, though critics worry about the long-term legacy of temporary interventions. Nearby St Michan’s park on Green Street on the site of the site of an old jail provides a meeting place for Irish and immigrant families with a range of play facilities. 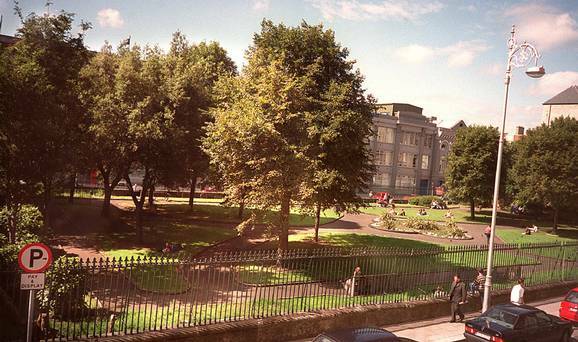 The City Council has committed to reinstate the grassland integrity of Mountjoy Square. At a time when funding is scarce much can be achieved with some creative thinking. Glasnevin Cemetery and the Botanic Gardens share a common boundary and recently opened up a gate allowing visitors to walk between the two, adding civic value at a low cost. A pedestrian crossing linking the National Gallery and Merrion Square could greatly increase access to one of the great Georgian Squares. Nearby, however, Fitzwilliam Square remains under lock and key, sharing the dubious privilege along with De Vesci Gardens in Dún Laoghaire of being private squares in neighbourhoods lacking in publicly accessible green space. Little headway seems to have been made in addressing the ubiquitous challenges and opportunities of our post-war soulless suburban stretches of grass. Perhaps local councils, the Office of Public Works and indeed, crucially, Nama are not protecting and enhancing public spaces with the zeal and imagination necessary if they are to become engines for a transformation in our quality of life. The role of parks and open space in fostering biodiversity is now recognised. The “Green City Guidelines” published in 2008 by the UCD Urban Institute, Dún Laoghaire Rathdown and Fingal County Councils showed how nature and green networks can be enhanced in cities and towns, even next to high-density urban developments. They also illustrated the importance of green roofs, green walls, permeable surfaces and sustainable drainage systems in protecting and enhancing the environment. More importantly they emphasised the importance of access to nature in an urbanising world. Guardian writer George Monbiot has written of the crucial role “re-wilding” of open spaces can play, not just in fostering biodiversity but in opening up human nature and imagination. A debate is needed on the risks of promoting wild spaces where children are exposed to the real-life risks of climbing trees and encountering strangers and of the dangers in lost spontaneity, and lost exercise in a world of burgeoning obesity of cosseting our children in carefully manicured spaces and gated playgrounds with shock-absorbing surfaces. Over the coming months in a series of articles Village will take a look at green and public spaces across the country and ask what needs to change to ensure that they are suitable for today’s needs. We will highlight the best and worst examples of the planning of open space and parks from recent years. Architectural conservation, as one should never tire of pointing out, is about preserving as much as possible of the old, consistent with the need to create new buildings and spaces. Of course, nearly everyone agrees that there should be some preservation of our built heritage, the problem lies in defining just how much is to be kept. Dublin City is very much a case in point, being subject to a frenetic pace of new building courtesy of the 'Celtic Tiger' economy these past number of years. Inevitably, some fine old buildings have been viewed as surplus to requirements by the impatient cubs of the said Tiger, and have been reduced to rubble as a result. There are exceptions to this trend, it must be said, where some attempt is made to preserve an old building and put it to new use. One example is that of St Mary's Church in Dublin, which having been closed for many years due to the decline of its Church of Ireland congregation, was in a seriously deteriorating condition. St Mary's has now been refurbished for use as a pub and restaurant, and while hardly ideal and somewhat flash, this use is preferable to the alternative of continued decay. However, it is not the church building which primarily concerns us here, but the adjoining churchyard and its gravestones, which have recently been subject to radical overhaul by Dublin City Council (characteristically, this is a modern replacement of the centuries old name 'Dublin Corporation'). St Mary's Churchyard, now called Wolfe Tone Park, was the burial place of a number of famous individuals, including the United Irishman Archibald Hamilton Rowan, the founder of Mercer's Hospital Mary Mercer, the philosopher Francis Hutcheson and the hanging judge Lord Norbury (though apparently not the actor and theatre manager Thomas Sheridan, as is indicated on a wall plaque erected by the City Parks Department). In keeping with the modern mania for windswept open urban spaces, the old churchyard railings have been eradicated, and a desert-like dust covers some of the pathways. 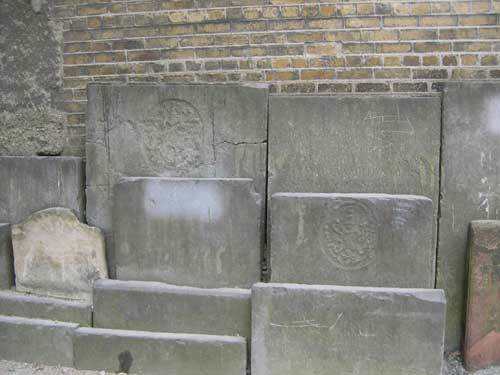 The above photograph of stacked gravestones in a corner of St Mary's Churchyard illustrates a past method of dealing with old memorials of the dead in Dublin burial places, the result being that the stones are preserved but most of the inscriptions simply cannot be read. The city fathers obviously considered that a different approach was required today, but alas what they have chosen to do is much worse. Numbers of the old gravestones in St Mary's have been laid out flat in the manner of paving stones, so that visitors may walk freely over them. Leaving aside the matter of disrespect to the dead, it can be considered how this will accelerate the already established process of wearing away of inscriptions. Historians, and genealogists in particular, value the information to be found in these archives in stone, and it is difficult to believe that any experts in these disciplines would have given their approval to the way in which gravestones have been treated in St Mary's (characteristically, they probably were not consulted). Over the years hundreds of old gravestones have been stacked or removed entirely in order to facilitate the creation of 'pocket' parks in Dublin City. 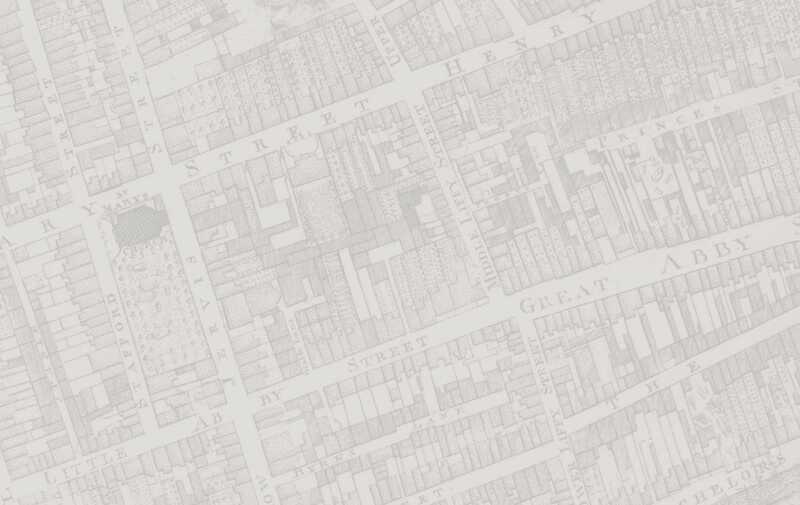 In the past the present writer has endeavoured to remonstrate with the Dublin civic authorities with regard to the mistreatment of city churchyards, for example, St Catherine's, Thomas Street, but to little or no effect. There is a mania in Ireland today for tearing out old fabric and replacing it with tawdry modern materials, and indeed to the perpetrators of such vandalism the expression 'patina of age' probably connotes some sort of disease worthy of eradication. While not optimistic that anything will be done, the writer nonetheless calls on the relevant authorities to place the surviving tombstones in St Mary's in a protected enclosure and to arrange for the recording of their inscriptions.